I like dogs; I just don’t want to own one. They tend to keep the owner from things like travel and a clean carpet. I also agree with Bob Barker that more people should have their dogs spayed and neutered. People in the states do a pretty good job of this, but I never realized how well until I came to Thailand. In the states, yes, the humane association shelters are over flowing and there are more dogs than are wanted, but it’s pretty organized compared to Thailand. There are dogs everywhere here. The population is about 96% Buddhist, meaning most people don’t believe in putting unhealthy dogs to sleep or birth control. Most people also don’t have the finances or ability to have their dogs spayed or neutered. Because of this, there are dogs everywhere and many of them don’t have proper owners. I’ve seen some pretty mangy ones, too. Luckily, the Peace Corps knows the dangers these dogs show and gave all volunteers a series of three rabies shots during training in case we are bitten. Most of them lie in roads and under trees all day and don’t do much. Most of the time they could care less I’m walking or biking by. However, just like in the states, there are some that see someone on a bike or running by and have to chase and there are no leashes, let alone leash laws. There are a select few who have evil intentions, too. It’s on these rare occasions when my mind changes and I don’t like dogs. Buddhists also don’t believe in causing harm to dogs. I’m Catholic; I have no qualms harming a vicious dog. I think even Jesus would put a foot in the face of an oncoming Thai dog if it showed harm. Dog lovers, please know that I really do like dogs, just not the ones with their rabid eyes on my ankles. I love to read books, but it doesn’t mean I like to read James Patterson novels. I love to listen to music, but I can’t stand the f***in’ Eagles. Some of these dogs are nothing but Along Came a Spider and “Peaceful Easy Feeling” rolled into one. I’d probably kick Don Henley if I could, too. Ninety-nine percent of the time I go by a dog on the street, the dog acknowledges me with a look that says, What’s up? I’m going back to sleep with my head on the white line. Don’t mind me. I give a look to the dog that says, I wish I could help you, dog. In fact, I’d like to give you a pat on the head, but I need to eat with this hand. 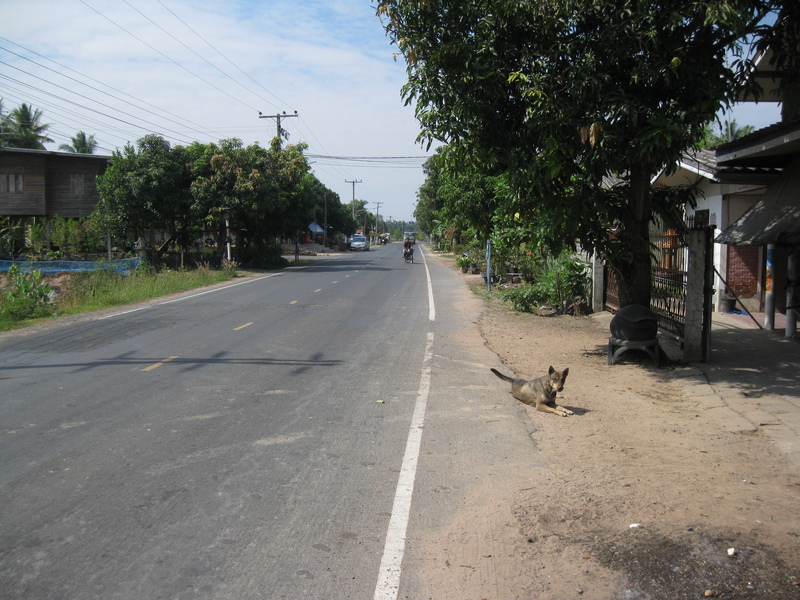 This Thai dog is a rarity - he's on the correct side of the white line and he's awake. I had an instance last week where I needed to use some self-defense on a group of dogs. Every other morning I run five kilometers and on one of my routes, there’s a driveway I run by with anywhere between one and five dogs that bark at me. I always cross to the other side of the highway to avoid them, but this doesn’t help when there’s no traffic. Some tactics I’ve come up with to scare the dogs away are to raise my hand in hope the dog thinks I have a weapon or stop running/biking to show the dogs I’m not afraid of them. Whatever the case, I show no fear. If they sense fear, I’m worse off than a woman looking for a date at a Star Trek convention. As I was running by the dog-full driveway last week, they started to bark and run towards me. I turned around as I ran and raised my hand. Some of them backed off, while others just slowed. I kept trotting and keeping an eye on them, but there were one or two who kept a close distance while incessantly barking and snarling. I gave them one last chance when I completely stopped, far from the driveway now, and raised my hand with a rock in it. Two kept approaching and my ankles did not feel safe. Back off, dogs, I’m not bluffing. Everyone always bluffs. They never really have a rock. This is your last warning, dogs. You’re Buddhist; you’ll get bad karma if you exhibit violence. I’m not Buddhist, I’m Catholic. All I have to do is ask for forgiveness and I have a feeling even Jesus would throw this rock. I then proceeded to pitch a Joe Nathan-fastball into the front dog’s ribs, sending it scurrying back, yelping and tail between the legs. The dog yelped all the way to first base while the others looked at it in confusion. What’s wrong with Larry? I saw that white guy move his arm really fast and now Larry’s hurtin’. Larry, what happened? Run, you fools! He’ll get you, too! I ran to the two-and-a-half kilometer mark and turned around. The dogs were nowhere to be found on the way back. This entry was posted in Peace Corps and tagged mean dogs, peace corps by Jeff Jackson. Bookmark the permalink. Love your writing. Especially the dogs talking to each other! Love your post, glad to find your blog! They’ll be back, they always come back…like the “boys of summer” and drummers that are lead singers. You realize I’m sending all these post to the publisher. I get 20% of net profits from your first book!